Many experience anglers will tell you that an angler is only as good as his or her equipment. This might not be strictly true (experience and execution play a big part) but there is some truth in it. Either way, every angler needs to know how their equipment works. This is one of the most obvious pieces of equipment needed for fishing. Generally, they are around six feet in length. 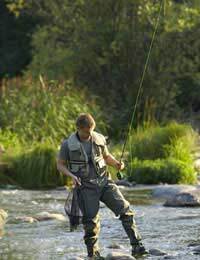 In a nutshell, a fishing rod is a long and straight pole, which has a lot of flexibility. Most beginners use rods made from fibreglass, as they are harder to damage and cheaper than other types of rod, but bamboo and graphite are frequently used as well. Graphite is a favourite of many experienced anglers, as it is light and strong. Rod lengths vary. Short, flexible rods are often used if there are branches hanging over the water that will restrict how far you can cast. Short but sturdy rods are often used to catch big game fish. Long rods are often used in moderate winds. It is the rod's diameter that affects how flexible it is, and as you might expect, the heavier the fish, the more robust the rod needs to be. Handles are made from cork or foam. The most reliable way to decide which suits you best is testing them before you buy. The reel seat (as the name suggests) refers to the place at which the reel is attached to the rest of the rod. To attach it, you simply need to place the reel in it and tighten it up manually. There are four main types of reels: spin cast, spinning, bait cast and fly. Spinning reels are one of the most popular types, but spin-cast are better for beginners. Each reel works with a different kind of rod. The options can be overwhelming, so it's useful to have a good basic understanding of fishing lines. Most are called 'monofilament' (mono for short) and are made from nylon. The type of line needed depends on a number of factors: the type of fish you're hoping to catch, the water in which you will be fishing, and whether there is vegetation (or other potential restrictions) in the water. This will help to tailor your equipment to the environment in which you'll be fishing. The more vegetation there is, the stronger your line needs to be. Hooks generally consist of several different parts. The eye is the part at which the hook is tied to the line. The point is where you put the bait, as well as being the part that enters the mouth of a fish once it's been caught. The barb ensures that the hook cannot easily leave the mouth once this happens. If you don't want to keep the fish, you might want to remove the barb (by pushing it down with pliers) so that the fish to easy to remove from the hook. This often makes it harder to catch a fish though. Match the hook to the size of the fish - the smaller the fish, the smaller the hook. Bait is used to lure fish. Nightcrawlers and earthworms are two of the best options. It's best to use a small earthworm is your target is a small fish, and vice versa. Be careful not to weight the hook down too much though if you're after a large fish. Store them in a cool place that won't get wet and take them out of the container once you've finished with them - if you leave them in, the smell will be awful! Minnows are close behind earthworms in terms of popular live bait. They are also best matched to the size of the fish. Keep them in a minnow bucket full of lake or river water while you're fishing, and change this water once an hour (preferably more) to stop them from dying. As with any bait, they will not attract fish if they are no longer alive. Worms from your garden are another good option. A pair of pliers will often come in handy when removing hooks from fish that you've caught.